If you move out of your original Body Shape you will need a bigger lateral move across in transition. Many of the older players used to have big lateral moves. We have just uploaded a new video. Enjoy! Most people with low arm actions have trouble with steep shoulders on the downswing or the right shoulder popping out as they try to shallow the club. In this new video Gary demonstrates how the right shoulder should work coming down and why steep shoulder and low arm actions cause so many problems. There is so much written about the left wrist and the bowed look great ball strikers get post impact. If you look at Gary’s players closely they all have that look. Many players have to flip the left wrist under or flex it down the target line. 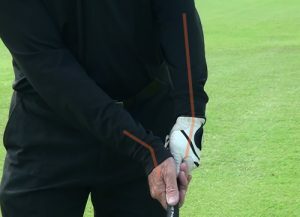 In this video Gary demonstrates the other option and looks at the secret in the wrist. Peter Senior just shot 11-under-par in the opening round of the NSW Senior Open at Thurgoona Country Club Resort. Senior only missed one green and made one bogey in an otherwise flawless round of golf. 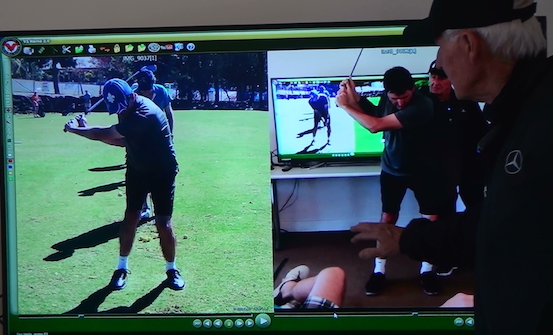 He has been working hard on his swing in the lead up to the Australian Open in November. Senior currently leads the field by 9 shots. Nice Playing Pete! Jan Stephenson is possibly the hardest working Right Sided Tour Professional. Jan is an integral part of the Edwin family and continues to prove that age is no barrier in golf. Today Jan was inducted into the World Golf Hall of Fame. Jan has achieved so much in the last few years and is now being appreciated for all she has done in her career. We are lucky enough to have a video record of her journey. Congratulations Jan from all of us here at Gary Edwin Golf. Most golfer’s have no idea what swing pattern they are! If you do the groundwork and understand your pattern and what causes your swing faults, you have a much better chance of fixing them. Quickly in this case! We have just uploaded a new video for all the over-rotators! You know who you are! In the early 2000’s Gary did a clinic with the great Moe Norman. Moe talked a lot about the importance of his starting angles and how his lower half really worked. Many golfers get over-shaped at set-up and it makes their bodies rotate too much over the right axis.In this video Gary talks about over-shape and how it effects the leg gap back and down. The arms pull the body into a turn. You can turn a lot and and still not get any coil. Turn in the wrong direction and you can’t swing your arms down. We have just uploaded Gary’s response to the question: Is it an Arm Swing or a Body Release?